Qi Shufang, founder of Qi Shufang Peking Opera Troupe in the United States, led her troupe and participated in the sixth Peking Opera Festival which kicked off in Wuhan, Hubei Province, early this month. 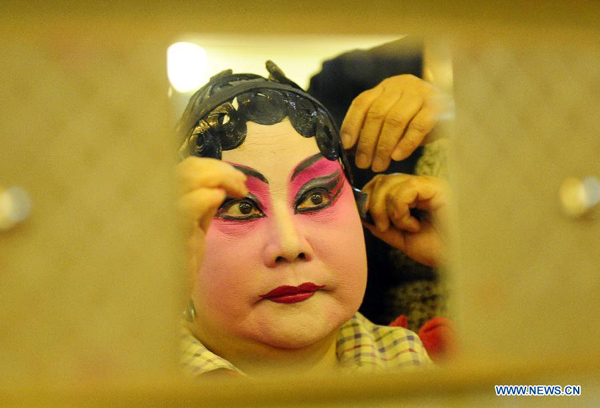 Qi Shufang, founder of Qi Shufang Peking Opera Troupe, makes a face-painting before performance during the 6th China Peking Opera Art Festival in Wuhan City, capital of central China's Hubei Province, Nov. 8, 2011. Qi Shufang, founder of Qi Shufang Peking Opera Troupe, is well known both in China and in the United States as a master performer. Qi started studying Peking Opera at the age of four and later went to the Shanghai Dramatic School. After winning first prize in a competition for rising actors in 1960, she was praised as a "promising opera performer" by the legendary female impersonator Mei Lanfang. Qi became a sensation throughout China at the age of 18 thanks to her performing in the "model operas" during China's Cultural Revolution period. Her reputation as a performer grew due to her facility in martial arts, riveting acting and her striking singing. In 1988, Qi relocated to New York where she formed an opera company and started her career to spread the traditional Peking Opera to the American public. Within over 20 years, more than one million American people have viewed the performance by Qi Shufang Peking Opera Troupe, which has enjoyed wide acclaim. Qi has held annual Peking Opera Festival for consecutive 11 years. In 2001, Qi was awarded the National Heritage Fellowship, the highest honor in traditional folk arts in the United States. This year's Peking Opera Festival is held as part of the Chinese government's efforts to revive the traditional art form. The festival, which covers a wide range of Peking Opera styles, including new versions of ancient operas, modern performances and traditional operas, bring on the stage 33 shows performed by troupes from both home and abroad.